We have noted so far in the series that the central pillar of true Christian discipleship is knowing and treasuring Jesus. 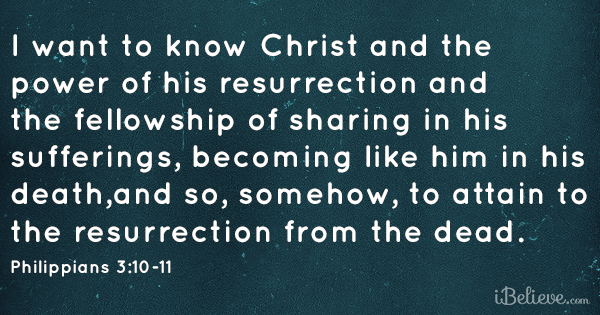 If we take a step back and look at this verse in its wider context then we can see that true discipleship is intimately connected to our understanding of what Jesus has done for us through his death on the Cross. We cannot know or treasure Jesus in any meaningful way unless we are convinced that we are clothed in His righteousness. The message of the gospel is not merely that we are forgiven. It is that righteousness is imputed to us. In other words, the good news is not simply that it is “as if we never sinned” (as wonderful as that is) but also “as if we have always obeyed.” This is what Paul believed and this is why he valued Christ above everything else. If we are to know and enjoy Christ in our lives, we need to avoid legalism at all costs. We diminish the value of Christ in our own minds if we fall into the trap of thinking that we need something besides him to make our lives acceptable in God’s sight. If I trust in a combination of Christ’s work and my own moral performance, I am telling myself that Jesus is not that great a treasure. It means that we believe he is not able to save all on his own. This is an attitude that stems from idolatry, not from faith in God’s Word. It comes from a pride that asserts our importance rather than Christ’s sufficiency. Jesus is all-sufficient. Through his death on the Cross, Jesus suffered the wrath that we deserved. Not only this, he satisfied the righteous requirements of the law on our behalf. He took our sin and guilt. He gave us his perfect obedience. God now looks upon all those who trust in Christ as if they have always kept the law perfectly. Nor fear, with Thy righteousness on, my person and off’ring to bring. Next postPsalm 1: Who are you listening to?